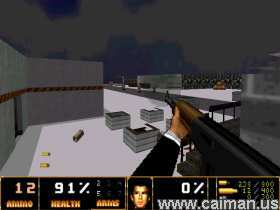 Caiman free games: GoldenEye Doom2 TC by Derek. Remember back in 1997 there was a little game called Goldeneye 007 for the Nintendo 64? It was one of the most popular console first-person shooter in its time. Goldeneye 007 combined elements from previous FPS games such as Doom along with it`s own new elements such as stealth and varied mission objectives. It was one of the greatest games to ever hit the Nintendo 64, maybe any console! Now someone has decided to "remake" Goldeneye using the DOOM engine that was released as open-source by id software the same year the original Goldeneye was released, 1997. Almost every level in GED2TC has been faithfully recreated as closely as possible with the Doom engine; the only levels I was not impressed with were the Surface levels. Most of the same sounds from Goldeneye are also here, including Boris` famous yell "Yeeesss! I am invincible!" Unfortunately, I have noticed some graphical glitches in the skybox and the glass in game is usually opaque unless you turn off Smoothing in the Options menu, which will produce pixelated graphics. Looking past these problems, GED2TC is about as good looking as the Doom engine will ever be. 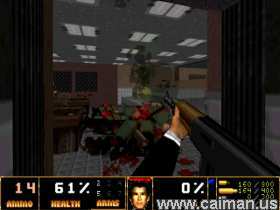 GoldenEye Doom2 features addicting gameplay and dynamic objectives almost on par to the original Nintendo 64 game. I had a blast playing through the single player missions, but unfortunately, they are not complete. The "Control Base" and "Water Caverns" missions from the original Goldeneye have not yet been completed. However, you can play online using the Zdaemon source port that can be downloaded below! Now, selecting which download you need can be tricky. Usually, you`ll want the standalone EDGE version below. If you prefer to use a different engine rather than EDGE (such as Zdoom or nxDoom), you can download just the WAD files and DeHacked patch from the links below. You can download many engine source ports from the links below, as well. You will also need to grab a Doom 2 IWAD, you can either get this from a registered copy of DOOM II, the standalone EDGE version, or from the FreeDoom website (below). Please note that the shareware IWAD file will not work! If you want to play online, you should download the Zdaemon port below, but you will still need to find a Doom 2 IWAD to play! If you didn`t understand a word of that or just aren`t sure, then you should download the standalone EDGE version. Download WAD files and DEH patch 2.67MB. DOOM engine source ports .